Completed Portraits: British 19th C, Wales: Artists and Subjects 12 comments Did Hugh Carter paint this portrait of Samuel Holland? This discussion is now closed. This portrait of Samuel Holland is now listed as by Hugh Carter (1837–1903). This change will be visible on Art UK in due course. Thank you to all for participating in this discussion. To those viewing this discussion for the first time, please see below for all comments that led to this conclusion. 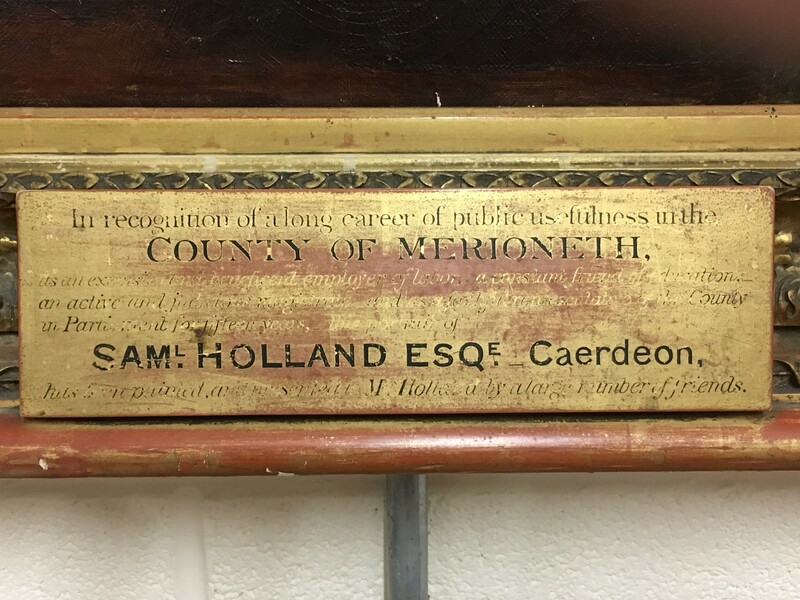 The newspaper piece refers to an inscription, presumably on the frame. Is that no longer present? Might I ask also that we get some confirmation about the inscription on the frame from the collection? It may well say that Hugh Carter is the artist. And that does seem to be the logical deduction based on the article attached. There is some stylistic affinity between the feathery touch in oils here and Carter's practice in watercolours and pastels. Both sitter and artist were well known figures, not anonymous by any means, so it should be possible to resolve this question. At least one of Carter's oils on Art UK is signed, such as https://d3d00swyhr67nd.cloudfront.net/w1200h1200/GLA/GLA_HAG_44150.jpg but the one under discussion here does not seem to be. Well done, Paul, for starting off the discussion. A close look at the signature, as Andrew had done, is fairly conclusive. The collection might like to confirm, but I think we can close this one, with a recommendation that the painter of this portrait be changed from unknown to Hugh Carter (1837-1903). Thank you, Anwen. This does help. Might just be worth taking a very close look at the signature and see if it is signed "H. Carter" or "Hugh Carter", just to finalize the discussion. Even on Art UK's image, from the shape of the signature I think one can be pretty confident that it is 'Hugh Carter' in full - but I am sure Annwen Jones will be happy to confirm. 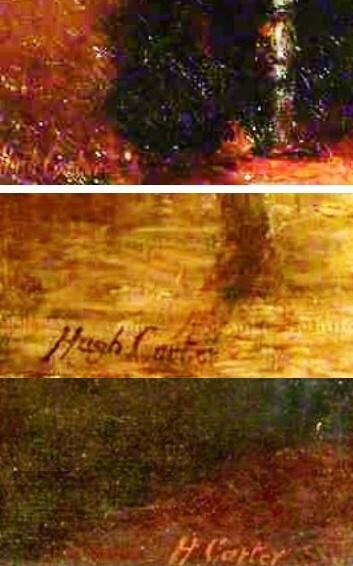 Here is a composite of the best close-up image I could make of the signature from our picture (top) with two clearer ones from other works on Art UK. It actually looks a bit like 'Mark Carter', but could easily be 'Hugh' (and in the context undoubtedly is). Thanks to all. It is conclusive that the portrait is by Hugh Carter so the collection and Art UK can now identify it is as his work. The collection has been notified of this recommendation.